At dawn, before the sun's first rays remove the haze, the breakfast is prepared. Northern Thailand is equal to "trekking". A "must" for most people who visit this area. What makes it so attractive to trek here is a multitude of different reasons. The terrain is ideal for first time hikers. You can get a sweat, but everybody with normal conditioning, will complete the tour. Only by staying in the tribal villages in the mountain, it will be possible to get close to everyday life and traditions. The scenery is world class and only by moving on foot, you get the discoveries printed onto the retina of eternal remembrance. You get thoughts during the trip that will change your attitude to what life is about. Parts of yourself, you would not have thought existed, becomes exposed. Close ties are formed with those you share the adventure with. The Trekking tour is led by local English-speaking Explorers, with the knowledge of customs, herbal medicine, flora and fauna, neither are they not afraid to give a helping hand in the process. Welcome to a perfect adventure in harmony with nature! Target group: The tours are suitable for everyone - including families with children. The period from November to February is popular with reasonably stable dry weather and lower temperatures. Night temperatures in the mountains can* (*can mean the possibility is present but does not necessarily) fall below 10oC, - which is cold. Thermal jacket recommended carry along, especially in December, January. Daytime temperatures go up to 26-30oC. From March to May the temperature is generally higher. May-November featuring changeable weather of sun and tropical rain showers. It can certainly rain during the dry season and it may also well be the sunshine in the rainy season. Price includes VAT. Two/Way Chiang Mai transfers by pickup truck with benches along the sides and canvas roof. Morning, noon and evening meals are freshly prepared. Drinks are offered at reasonable prices in the villages. Bottled water brought from each base or village must be carried by the participant themselves. The period from December to February is the busiest period. Let Wild Kingdom Tours book your hotel in Chiang Mai and we will make sure that the Trekking Guide, presents himself at the hotel the day before the tour starts, with equipment, sleeping bags, mosquito nets and backpacks. Simultaneously, he will brief you about the last details before tour start the next day. Minimize what you bring with you. Unnecessary luggage can be stored at the hotel in Chiang Mai, until you check in again. Shared room with madras on the floor. Clean sleeping bags handled out at the tour starts. Other sleeping equipment is not included. Toilet facilities are basic and the shower water is stored in a barrel and dipper helps you getting wet. It’s not possible to check e-mail during a trek, and often you are out of range for mobile coverage. • Airy and comfortable clothes for warm climates. • A warm sweater or jacket for cool evenings. • Swimwear and towel, soap, shampoo, toothpaste / brush, toilet paper. .
• NB. From March to May is the dry season with low water levels in rivers and waterfalls. • Hiking boots are best in the wet period. Footwear with heavily ribbed soles is necessary throughout the year. It is also a good idea to train thigh muscles before leaving from home. • Sandals (flip flops are perfect to switch to after arriving to the place of night accommodation). • Extra eyeglasses, if used. • The villages visited, live by traditions that have been practiced for generations. • Gadgets in the form of handheld game consoles, GPS's, laptops and the like, has no legitimacy among the hill tribes. To flash this kind of electronics in front of local people, serves no purpose other than to contribute to the impression that we are from another planet. • It is not unusual to be asked about what you earn. To respond honestly to those questions would serve no purpose other than to contribute to the impression that we are from another planet. • Avoid exposure of vital parts of the body as it is considered to be offensive. Bikini has no legitimacy among the indigenous people and can be offensive. To explore a village bare-chested, will also get the locals to think there's about us. Thais are polite people and possess an enormous tolerance towards us. For this reason, locals seldom point out things we do wrong. - One doesn’t need to fear theft and other crimes from the mountain residents. Such incidence on foreigners is almost unthinkable. ** For every offspring of a modern contemporary family, it should be a part of the upbringing to witness the everyday life of the people in the mountains. So many things in our civilized world are considered a matter of course. It is important that you bring your passport, because we are walking near border areas. The programs are subject to changes in sequence and content if dictated by weather and/or guide or government officials. Book – Plan your Thailand holiday with the experts. Price including National Park fee, English speaking trekking guide, transport T/W Chiang Mai, 4 days / 3 nights stay = 2 nights under simple conditions + 1 night guesthouse in Mae Hong Son, meals and activities mentioned. Upgrade Mae Hong Son accommodation +surcharge. Mae Hong Son: Children sharing room with parents get 1 extra bed. Second child must share double bed with parents. 08:30 Pick up at your Chiang Mai hotel by guide in roofed pickup truck with benches. Driving through beautiful mountain landscapes towards Pai, where we take lunch. In the afternoon the trek starts and we hike about 2½ - 3 hours until we arrive to the mountain village of the tribe, called Red Lahu, referring to the color of their clothing. 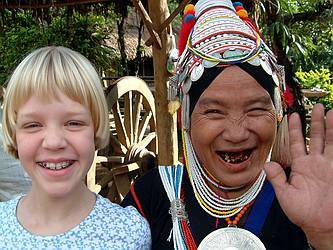 The locals will welcome you and may offer massage of sore feet in return of a few THB. Dinner is served with usual care. Normal standard is the availability of cold beer, soda or bottle water, which is chilled in a bucket of ice. In the glow from the fire, you are reminded of a different lifestyle than you yourself originate from. The huts we sleep in are built on stilts. The livestock are sleeping under the house at ground level. The sounds of the night are manifold. - It's not always the animals under the floor that snores the most. Night under primitive conditions - far from civilization. OPTIONAL STARTER: Get familiar with rhythm of Chiang Mai and Northern Thailand by taking part on a tour to Doi Suthep Temple and the Handy Crafts Village. English speakning guide & lunch incl. Breakfast and coffee is needed. Around 08:30 we start the trek again 2½ - 3 hour’s time. We walk through hilly terrain in the forest. Amongst we discover clearings and will see the hill tribe people work on the difficult accessible fields. Many places Slash and Burn are used, although it is prohibited by law. Trees in the forest are cut down the year before - especially the shadiest ones. When the wood is dry, its set on fire and the ashes fertilizes the soil before crops are planted. Nourishment from the burning is washed away by rain the following year and a new part of the forest, must then be burned. 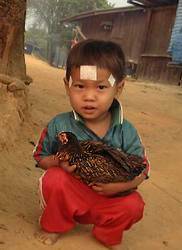 In the Karen Hill Tribe village we look around and follow the daily life. Our Pick-up vehicle has arrived and we continue by wheels on bumpy local roads to the Shan People's village where lunch is taken. A 3 hour hike will now lead us to an interesting burial cave of the past. The scene is like taken from an "Indiana Jones movie." The cave has been used by a community who lived here more than 2.000 years ago. 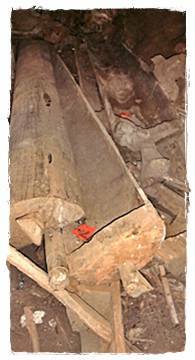 Several coffins are well preserved, but science has not yet found out why they are 3-4 meters long. Local people in the area, have no doubt that these persons where giants who had that height. On we continue for another 30 minutes until we arrived at the Black Lahu tribal village. Dinner will be prepared and the guide informs about this tribe and the next day's program before we go to bed. 08:30 After breakfast we leave the Black Lahu village by our Pick-up transport. 20 minutes later we make a photo-stop at a nice view point. Shortly after we arrived to the famous Phu Klon Mud Spa. A wellness treatment is a “Must Do” and we included a healing Phu Clone facial mud mask experience. Additional wellness treatment can be added at own expenses. Phu Klon's hot springs and mineral waters is flowing to the surface from deep down in the underground. The mud and clay carried up, is rich on minerals. These substances have a positive effect on human health, skin and the cardiovascular system. The natural clay is black and completely clean and uncontaminated by sulfur. Phu Klon was discovered by a group of French and Thai researchers who sent samples of the clay and mineral water to Thermalium Luxeuil laboratory in France for further analysis. Four years of extensive research has determined that the clay from Phu Clone meet international standards off requirements for microbiological characteristics. Reportedly there are only three other places in the world that can provide the same conditions for a natural mud spa. 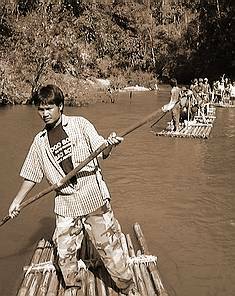 Twenty years younger we carry on to the starting point for bamboo rafting. Life jackets are handled out and we begin a 2 hours float down the river. Unspoiled landscapes are passed with the sound of the rippling river. The pace is consistent calm, but speed increases when small currents are in sight up front. Period of year and quantity of water in the river is crucial to how fast the ride will be. The last bite of routing will bring us to Mae Hong Son where we check in at Rome Thai Guesthouse (or equivalent). Rooms booked will be with air-conditioning. After a quick shower or 30 minutes rest flat on the bed, we head to the temple on top of King Mu Mountain. Wat Phra That Doi Kong Mu has stunning views across the valley where Mae Hong Son is located and in the glow of the sunset the impression increases. The holy temple is built in typical Shan style architecture and dates back from 1874. While darkness is about to boost we continue to a good restaurant in town. Dinner of your choice and expense. During dinner the guide informs on the next day visit to Long Neck People village. Way back to the guesthouse we pass the night market and a favorable purchase could take place. Night guesthouse Mae Hong Son. 08:30 After breakfast we check out and drive to the Karen Tribe elephant camp by the river in the jungle. This tribe has for centuries had elephant training as a specialty. Sitting in the chair on the elephant's back we start an hour's exciting elephant trekking through hilly terrain until arriving at the starting point for longtail-boats. 30 minutes up the river will bring us to Huay Phu Keang – The village of Kayan. 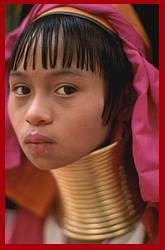 The women with brass rings around the neck, is often referred to as Long Neck Karen or Giraffe Women and is a 'reason why travelers come to Mae Hong Son. This minority group is refugees from Karenni State on the other side of the Thai / Burma border from Mae Hong Son. 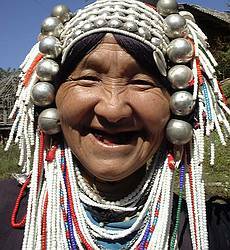 The tribe counts about 20,000 individuals in all and in Burmese they are called Padaung and in their own language Kayan. The decision whether to - or not to visit the village can be a difficult question. No one can fail to feel that they are on a tour in a human zoo. Do this feeling bother you; buy some of their handicrafts to show that you support the village. In fact, it is not the neck which has been extended by the rings, but the shoulders that has been pressed downwards. The origin of this tradition is unknown and leads to many explanations. According to a Kayan legend, the tribe’s progenitor was a dragon lady with a long beautiful neck and the strange tradition is an imitation of her. Others say to know the tradition has arisen as a result to protect women from tiger attacks. At the return to Mae Hong Son lunch will be taken in a local restaurant before we return back to Chaing Mai with the goods of civilizations within reach. With unforgettable memories we expect arrival at the chosen hotel 18:00 -19:00. Wild Kingdom Tours will be pleased to help doing your hotel booking in Chiang Mai, before and after the trekking tour. We know hotels that can store remaining luggage, even if you are checked out during going around. Laundry can be taken care of subsequently to receive clean and ironed when you are back from trekking. Furthermore, we can arrange transfer service to/from the airport or railway station. Orchid & butterfly farm, elephant camp and ride 1 hour through the jungle, crossing the Tang River in the cable basket, lunch, 1 hour hiking to waterfalls, whitewater rafting & Bamboo Rafting 1 hour. Day 1 – Stop Mae Malai market, driving 2 hours until arriving in the Akha village, lunch, trekking through the green forest to a Lahu village, where we take dinner, evening and overnight. Stop Mae Malai market, driving 2 hours until arriving in the Akha Village, lunch, 2 hours trekking to the Karen village, where we take dinner, evening and overnight. Day 2 - breakfast, hiking 2 hours to another Karen village, lunch, 20 minute walk to the elephant camp, elephant ride 1 hour. Trekking 30 min. to Lahu village, where we take dinner, evening and overnight. Day 1 - Two hours driving through beautiful landscapes to Mog Fa waterfall. Lunch, mountain driving and continue to the hot springs, stop for a swim in the mineral springs, trekking 3 hours to traditional built Karen village, where we take dinner, evening and overnight. Day 2 - Breakfast. 3 hours of trekking through dense forest to the Karen village, lunch, 1 ½ hour elephant safari through the forest to the Lahu village where we take dinner, evening and overnight. Day 3 - Bamboo Rafting 2-3 hours on the Mae Tang River, lunch at the River Lodge, 1 hour trekking to the Akha village where we take dinner, evening and overnight. Day 4 - breakfast, trekking along the river to The River Lodge, lunch, time to relax and enjoy the scenery before heading back to Chiang Mai. Included: all meals, lunch first and last days, English speaking trekking guide, national park fee, Two way transports from/to hotel in Chiang Mai City Center in roofed pickup truck with benches, compulsory insurance max THB 100,000. When hotel is booked through Wild Kingdom Tours equipment will like backpack, sleeping bag, mosquito net will be delivered in the afternoon before start. Lifejacket available at bamboo rafting. Extra charge for pick up/drop off more than 4 km from the city center. 08:30 Departure from Chiang Mai. 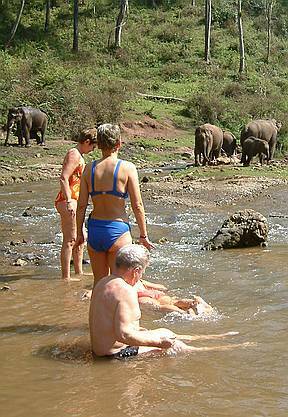 Drive 1½ hours to the elephant camp where we will do elephant safari 1½ hours. Then we walk 40 minutes until we reach the Hmong hill tribe village. Then return to Chiang Mai. Day 1 - 09:30 departure in pick-up truck from Chiang Mai. Stop local market 45 min. and on to a peaceful Buddhist temple with an unrivaled location. Lunch stop at Shan village and on to the waterfall with a possibility of a swim. Trekking 40 min. to Red Karen village, where we take dinner, evening and overnight. Day 2 - breakfast, 2 hours trekking through the green forest to the White Karen village. Drive 40 minutes until lunch. Stop at Shan village. Elephant Trekking 1-1½ hours, followed by 1 hour bamboo rafting in Mae Wang River. Day 2 - breakfast, 2 hours trekking through the green forest. We enjoy lunch on route until arrival at the White Karen village. Another 2 hour hike to unnamed waterfall and on to another Karen village, where we take dinner, evening and overnight. Day 3 - After breakfast 2 hours trekking to a Karen village where lunch is taken. Continuing with pick-up truck 30 min. where a cave is visited. On the road again 40 minutes to the elephant camp and ready for 1-1½ hour safari on the elephants back. We continue on foot along the Mae Wang River, where the bamboo rafts will be launched for a 1 hour tour. Return to Chiang Mai, arriving 16:00. 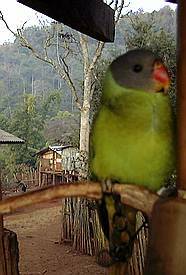 What does Wikipedia® have to say about Chiang Mai?